Our homes are filled with expensive equipment we depend on for basic comfort. When heating, air conditioning, or appliances such as the refrigerator, oven or entertainment system break down, how can we be prepared for the unexpected cost? Extended warranties or service contracts usually expire after a few years, but there is an insurance solution which is renewable and costs just pennies a day. Motors can seize or burn out, or an electrical circuit in the control board can fail. Burner can fail, blower motor can short and heat exchanger can crack. Surges, spikes and overloads can cause arcing and short circuits, damaging the main panel, wiring, switches, outlets – even plugged-in devices. An aging hot water heater can crack or rupture. Microelectronics and sensitive circuitry can cause televisions and entertainment equipment to simply stop working, for no apparent reason. Power surges can damage or destroy computers without proper protection. If parts break down and are obsolete, units may require replacement. Home Systems Protection is a blanket breakdown coverage for all your home systems, appliances, and electronics. It is not limited to one item only. 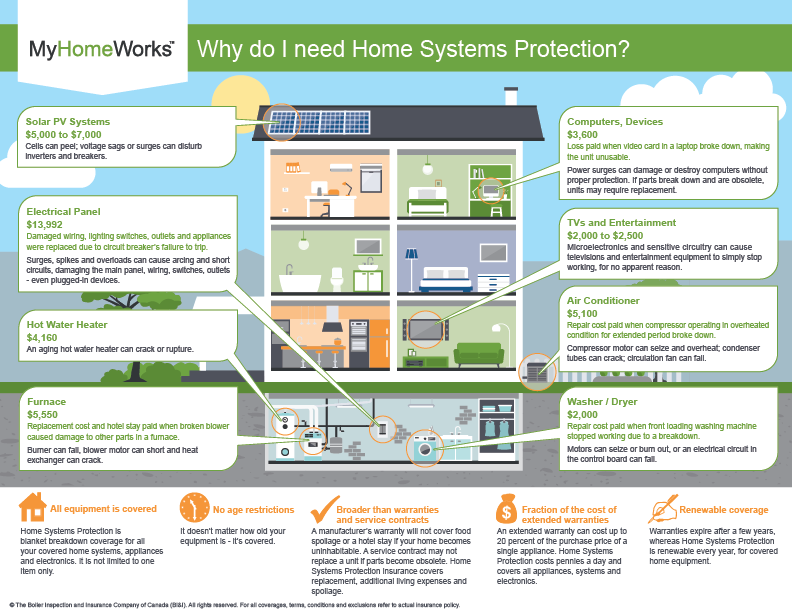 For more information about Home Systems Protection, contact the MyHomeWorks team.